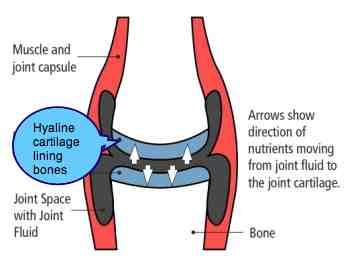 Hyaline cartilage is the vital substance lining the bones in your joints. Connective tissue is subject to serious degenerative changes in joints because it has no blood supply. It's the very hard substance that lines the bones in a joint; the material that takes the strain in the working parts. This is what a normal hip looks like. See how super smooth the cartilage is? Cartilage is what we call a connective tissue. It can be very flexible and soft as in the ear lobe, or flexible and tough as in a ligament or tendon. But what really interests us today, is the hyaline cartilage that lines the bones in our joints. Hyaline cartilage is vulnerable because it has no blood supply; it is utterly dependent on the continuous supply of fresh synovial fluid to provide nutrients and oxygen, and remove waste products. It's very hard and slippery, enabling us to bend our knees, move our toes, take a great deal of weight in the hip, and flex and extend our spines, all with minimal friction between the opposing joint faces. That would include our fingers and virtually all our joints with a few exceptions. Take particular note of the little white arrows. They show the movement of nutrients from the synovial fluid as it sloshes about in the joint, not literally, to the hyaline cartilage on the ends of bones. Without that flow of fluid, carrying nutrients and oxygen to the living hyaline cartilage, it would soon lose the ability to heal itself and begin to degenerate. What is critical about cartilage is that, unlike other connective tissues like bone, it has no blood supply. It is utterly dependent on the synovial fluid within the joint for its nutrition. 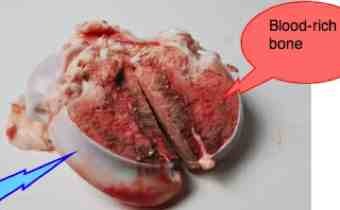 No rich, healthy sloshing fluid bathing the hyaline cartilage, and it will degenerate and die. And hurt. Pain. Put simply, damaged cartilage has far more limited ability to regenerate than bone does. Bone is flooded with blood. Cartilage not. Chondroitin sulphate. Does that say anything to you? Seen on the label of bottles in your health food store? The gelatinous ground substance of cartilage is make up largely of chondroitin sulphate, into which are embedded collagen and elastic fibres made of protein: hence you will see that chondroitin often comes with glucosamine, the precursor of proteoglycans, substances found in cartilage. They make cartilage flexible and very resistant to compression - it's that property that interests us with the hyaline cartilage on the ends of bones. 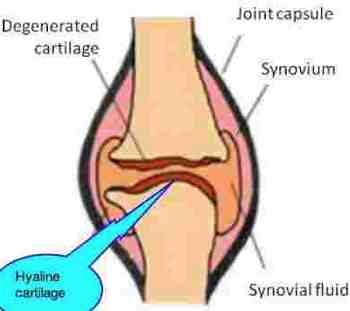 As articular cartilage, hyaline is found covering the articular surfaces of bones in synovial joints. It reduces friction, more slippery than ice, literally, and acts as a shock absorbing tissue. As the cartilage in your knee degenerates it causes discomfort and ultimately severe pain as a hole wears right through the cartilage to the underlying bone. Bits of the cartilage break off forming 'joint mice' that get stuck in the knee causing severe pain on straightening the knee. Cartilage is produced by cells called chondroblasts which are found along the vulnerable edge of the cartilage end plate. This is the place where new cartilage growth occurs. In HC the protein collagen fibers that are imbedded in the chondroitin matrix are very uniform giving cartilage its hard, uniform and slippery-white appearance. Typically, perichondrium is found around hyaline cartilage. The discs in our spines are made from fibrocartilage. The so-called "nucleus pulposis", a bubble of gelatine made up of substances called "glycosaminoglycans", made from the substrate glucosamine sulphate. Healthy glucosaminoglycans are able to bind water, and water is incompressible. This gives the disc its shock-absorbing properties. 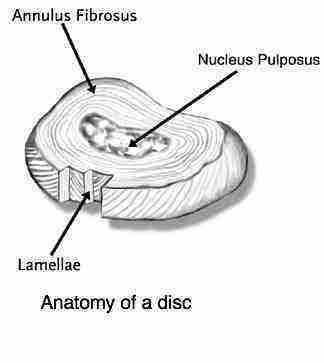 The outer ring of the disc is called the "annulus fibrosus". It is made from fibrocartilage, powerful collagen fibres arranged in a criss-cross ring, and attached deep into the endplate of the bone by very strong roots called Sharpey's fibres. Healthy cartilage is able to stretch outwards. When you lift something heavy, the nucleus bulges into the annulus and, being a liquid and thus incompressible, it also presses back against the vertebrae, pushing them apart. Healthy annular cartilage contains this bubble of water-rich, gelatinous gel (it looks a bit like egg-white) as it bulges. But diseased cartilage, particularly if you twist as the same time as bending and lifting, may rip, allow the gel to leak out. That is what chiropractic is all about! Getting the gel back where it belongs, without the use of drugs and surgery. In a normal knee, for example, there is a space between the two hyaline cartilage plates, one femur, one tibia. In obesity, these bones are forced against each other and, because the growing part of the cartilage is at the surface, the pressure damages the growing chondrocytes. 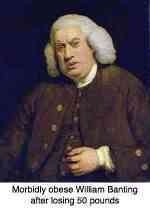 Obese woman are particularly vulnerable, but men are certainly not exempt. Pain! Before subjecting your grinding, painful knee to arthroscopy knee surgery consider a consultation with your local Chiropractor. This mind-blowing medical research indicates that a sham treatment, or placebo, was more effective than arthroscopy. 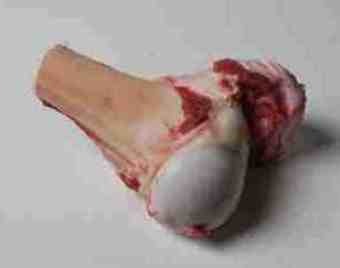 The cartilage under the kneecap is particularly responsive to gentle chiropractic mobilisation of the patella. The condition, patello femoral pain syndrome. It's as well to acknowledge cartilage enemies; they will cause us a lot of pain and, worse, disability. You don't mess with hyaline cartilage; it bites back. Obesity is the number one enemy of hyaline cartilage; increased pressure, in the knees for example, makes us lose our independence; pain is an aside, in my experience, in comparison with disability. Orthopaedic researchers in the Netherlands have designed a nifty device which draws the bones of the knee apart, whilst allowing them to keep moving. Preliminary results are very encouraging for those suffering from arthritis pain in knee. By wearing the device for two months, simply by taking the weight off the damaged cartilage, MRI studies have confirmed that knee joint distraction allows for a 50% increase in cartilage volume. Dr Lafeber's rationale for his Knee Joint Distraction technique for advanced osteoarthritis in the younger patient is that osteoarthritic cartilage is capable of self-repair if the weight is taken off. 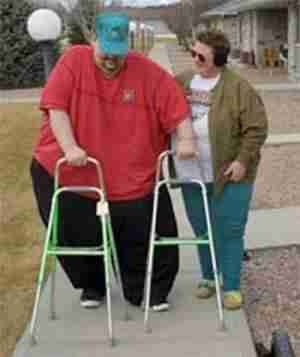 Obesity and arthritis go hand in hand. All living tissue needs oxygen. Nerve tissue, denied oxygen, dies within minutes. Cartilage takes a little long, but the process is essentially the same: starved of oxygen, cartilage ages much faster, and the chances of restoration are much less; smoking is public enemy number one. 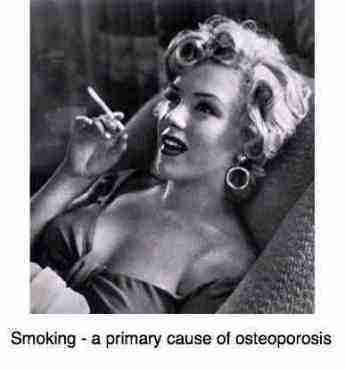 In back surgery it is well recognised that smoking is the biggest risk factor. Put differently, it is the greatest single factor likely to put the patient into what is known as FBS. Failed Back Surgery. The healing tissues simply don't get enough oxygen. Ask any Chiropractor, and s/he will confirm that in the treatment of acute low back pain with Chiropractic adjustments, that smoking with us too makes recovery more difficult. It takes longer, and the chances that you won't respond as well to chiropractic are much greater. Low Back Pain research indicates there is a close association between vascular disease and Lumbar Disc Degeneration. is a complex condition of degeneration of the hyaline cartilage lining the ends of the femur and tibia - major weight bearing bones. It usually comes after injury to the knee (such as torn ligaments), excessive weight and poor diet. There is no magic formula and no treatment works really well. Chiropractic Help certainly has a contribution to make, confirmed by the number of patients we treat with knee arthritis. Research shows the most effective treatment is also the most difficult; weight loss. These free weight loss programs have much to offer; cutting out all the refined carbohydrate with a moderate increase in the healthy fats like olive oil and avocados is the way to control the dreaded feeling of being famished. For strong healthy bones, the body needs adequate amounts of a group of fatty acids called omega-3. They are found mainly in fatty fish, nuts such as walnuts and pecans and freshly ground flaxseed. The big plus is that omega-3 simultaneously has powerful anti inflammatory properties, as well as benefits for the heart and mind. Anti inflammatory omega 3 is part of the solution to angry joints and muscles. So too the B vitamins are essential for healthy bones and nerves, keeping the levels of a toxic substance called homocysteine down. Add to this the waste products of cartilage metabolism that are not quickly removed; that is why Chiropractic subluxations are a disaster waiting to happen. Vitamin D is vital in the care of hip pain because of its affect on hyaline cartilage growth. Fixated joints that reduce the flow of synovial fluid succumb to immobilisation arthritis. Cartilage lacks a blood supply and is restored far more slowly than other living tissues. But, given the right environment, your aging hyaline cartilage, and other types of cartilages as in the intervertebral disc, can heal, BUT it requires a diet rich in the necessary ingredients, plenty of oxygen, and plenty of movement. Movement, both at macro level (the whole body), and the microlevel - at the level of individual joints. Removal of waste products of hyaline cartilage metabolism, otherwise they start to irritate the nerve in the foramen which is located right between the joints in the spine. And that is exactly what Chiropractic is all about! Because bioflavonoids increase tissue permeability and collagen synthesis, something as simple as drinking a glass of freshly squeezed orange juice will contribute to the healing of hyaline cartilage. Orange juice facts explains why OJ just isn't the same thing; think whole, freshly prepared foods. It hardly seems possible, but almost as many patients at the Chiropractic Coalface are complaining of foot and ankle pain as low back pain. In fact, truth be told, a painful foot that makes you limp is probably the underlying cause of your lower back pain. Take this letter received this morning from a reader. Think she might soon be suffering from low back pain? I sprained my ankle nearly twelve months ago, and it's still swollen and the ankle is burning and tingling. I had a scan four months ago. No broken bones were found. The bridge of my foot is very painful whilst walking, and really it's not improving. Orthotics have not helped in the slightest. Fixated joints in the foot and ankle lead unerringly to immobilisation arthritis and chronic foot pain. Ankle joint pain and the hyaline cartilage are intimately linked. GLUCOSAMINE CHONDROITIN - unfortunately the research doesn't bear up the claims. These mackerel recipes are rich in omega-3.